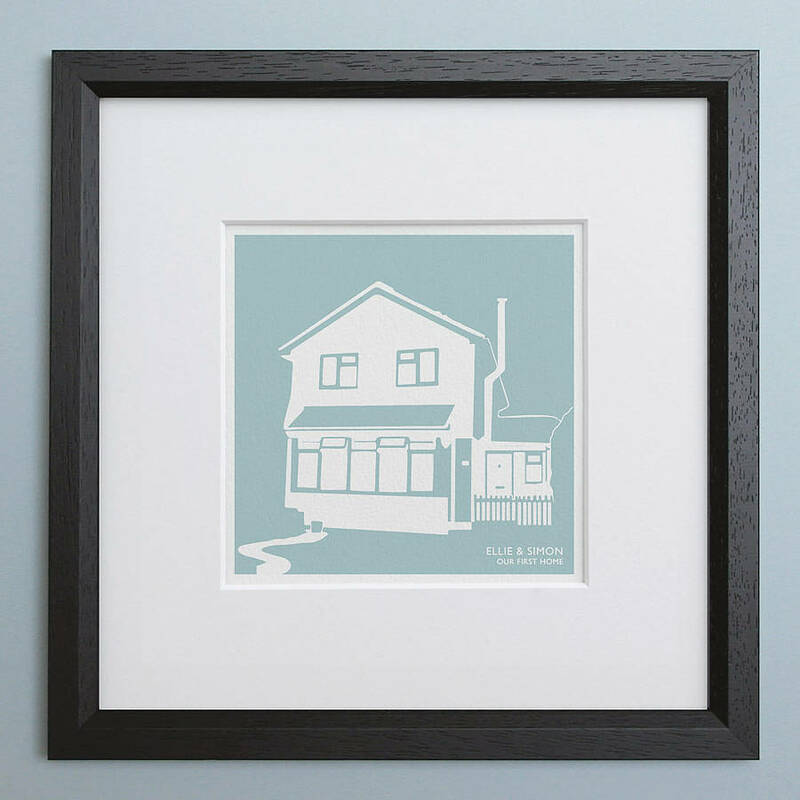 A bespoke graphic illustration of your house based on a photograph provided by you, printed in a choice of 3 colours. 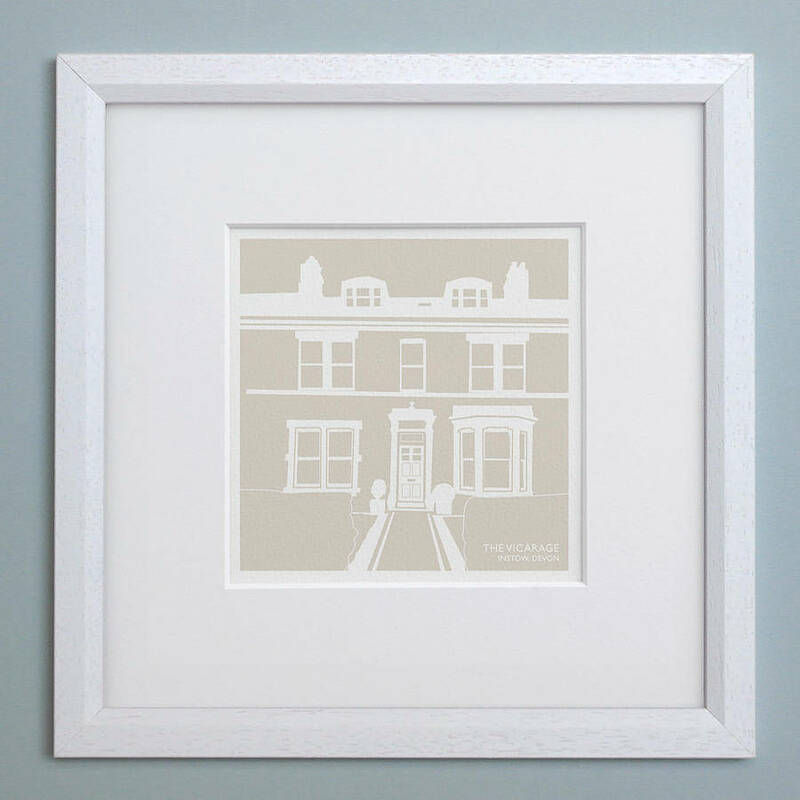 This contemporary print shows your house in silhouette against a block colour of moss green, dusky blue, or stone (or contact us if you want another colour). You can provide your own photo after ordering, just upload them via notonthehighstreet.com by going to My Orders and submitting an enquiry, or we can work from Google street view or a weblink (see below for instructions). Every illustration can be further personalised with a printed message below the silhouette. After ordering go to 'My Orders' on NOTHS. Submit an order enquiry then upload a digital photo here. Or we can work from an image on a website, just send us the link. Or use Google Street View - go to Google.com, click on ‘Maps’ and enter the address. Click on the street view of the road or drag the yellow stick man onto the map. Use the pointers to locate your house. When you have a good view, click the link icon, copy the link and send it to us. Your Illustration will be a graphic silhouette of the property drawn by hand on computer, so we can add/remove things you don’t want eg: cars / lampposts, we won't include dustbins, satellite dishes etc. We will draw the perspective from the photograph. 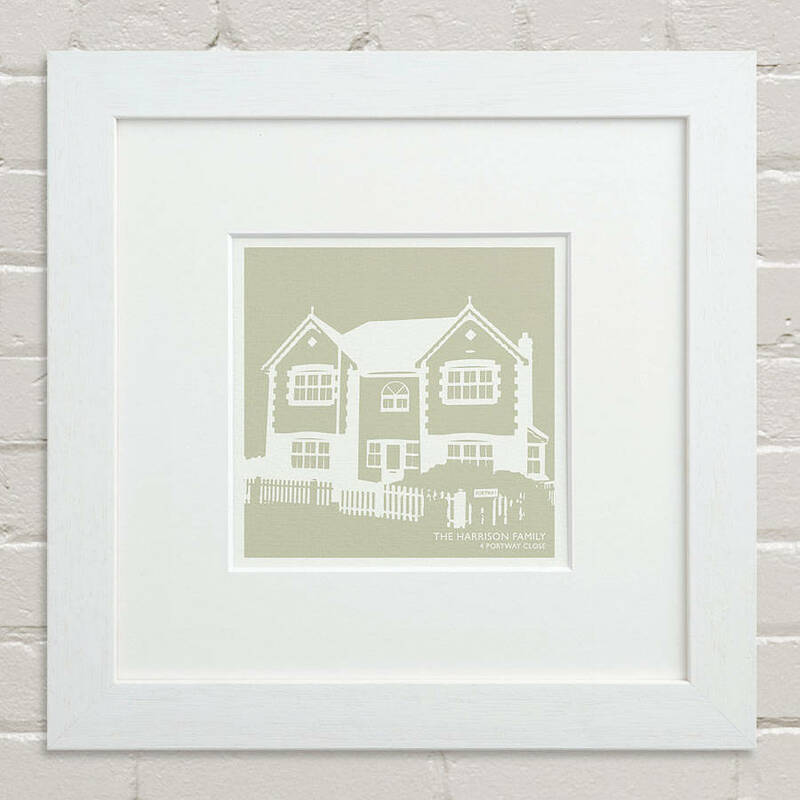 It’s a simplified silhouette showing all the major features of the house but if you want a particular element emphasized just let us know on ordering. You can select to see a digital proof before printing when you can check the artwork and make amends, although a charge will be made if you decide to cancel at this stage. The proof will be uploaded via a customer enquiry for you to check. 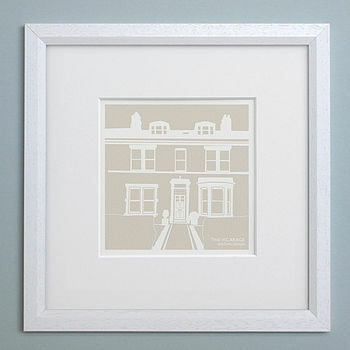 All illustrations are provided in a bevelled white mount. Contemporary wooden frames available. 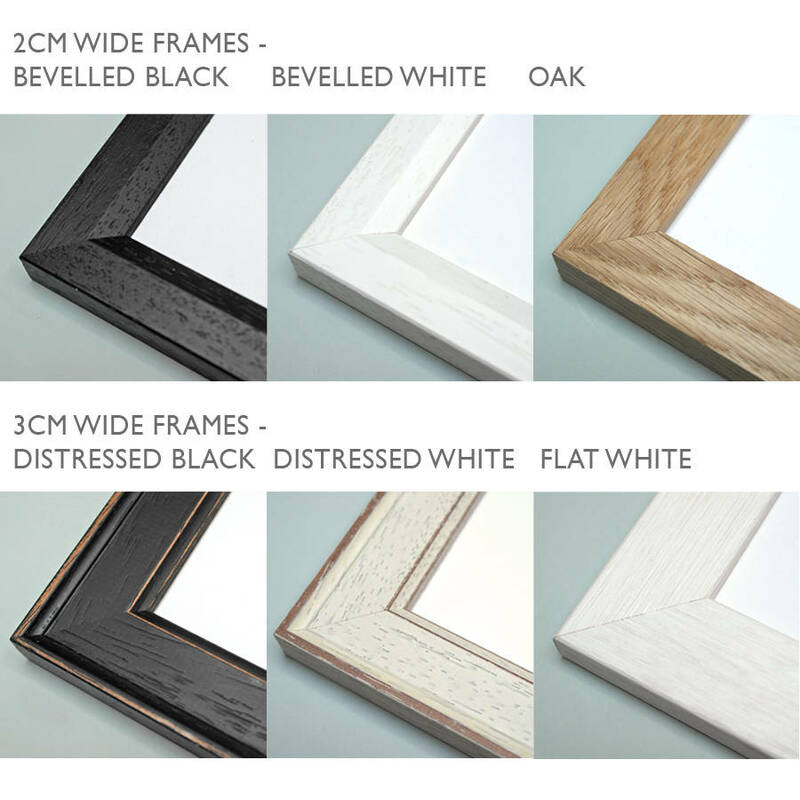 Styles available - bevelled black (2cm wide), bevelled white (2cm), oak (2.5cm), painted/limed white where you can still see some wood grain (3cm). Supplied with mdf backing board, integrated hanging hook, and Pilkington glass.